Students at The Gap State High School (GSHS) have been told they must wear black leather lace-up school shoes, which have a heel no greater than 20 millimetres and no lower than 5 millimetres. Karen Bishop, who has a daughter in Year 11, said the rule was “utterly ridiculous” and that she wasn’t aware of the height requirement before buying new shoes for this school year. “My daughter has a perfectly good brand new pair of black leather shoes for school yet it seems they don’t comply! I’ve just paid $350 for a resource scheme and just don’t have the funds for compliant shoes. Just give my child an education please,” she posted on Facebook. Ms Bishop said she would not be buying her daughter another pair of shoes. Dozens of comments from other parents on a community Facebook page support Ms Bishop. “Personally I think it is ridiculous. It’s like they are wanting kids to rebel. If they are black leather lace-up shoes I don’t see the problem,” one user said. “I’m not buying new ones either … no-one really has money to burn so she will have to wear them,” said another. 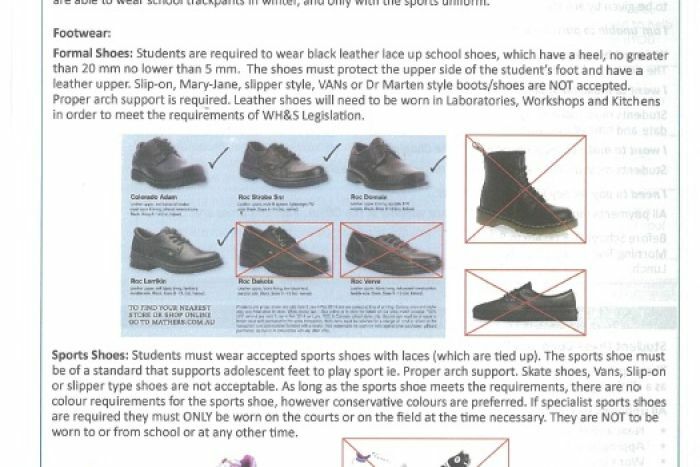 The school has issued pictures of what shoes comply, along with an endorsement for a retailer selling the footwear. Students have been warned they risk consequences for flouting the new rules, including after school and lunchtime detentions. We asked if your child’s school had any “ridiculous” uniform policies. Read about them in the comments. GSHS’s uniform policy is available on the school website and only states all students are required to “wear black laced-up leather college school shoes of plain conventional design”. A Department of Education spokesman said the student dress codes reflect school community standards and balance the rights of individual students with the best interests of the whole school community. “Ultimately, local school communities — including P&Cs and principals — are best placed to determine individual school uniform policy,” he said. “In the last weeks of term 4 2017 the student dress code issues were raised during a full school assembly advising the student body of the school’s expectations and students were to make arrangements to get ready for next year. Parents have been advised to attend the next GSHS P&C meeting on the February 12 to voice their concerns about the new school uniform policy. Posted on February 11, 2018, in ConspiracyOz Posts. Bookmark the permalink. Leave a comment.